Ron Shook, age 54 of Grinnell, died on Monday, July 30, 2018 in Grinnell. A graveside service will be held at 11:00 a.m. on Thursday, August 9th in the Lakeview section of Hazelwood Cemetery in Grinnell with Pastor Kirsten Klepfer, pastor of the First Presbyterian Church in Grinnell, officiating. Memorials may be designated to the Ron Shook Memorial Fund, mailed in care of the Smith Funeral Home, PO Box 368, Grinnell, Iowa 50112. Memories and condolences may be shared with the family online at www.smithfh.com. 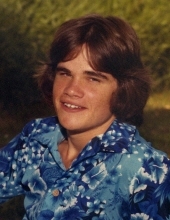 Ronald Alan Shook was born on July 28, 1964 in Grinnell, Iowa to Kenneth Leon Shook and Joyce Constance (Howard) Shook. He was raised in Grinnell and graduated from Grinnell High School in 1982. Ron was employed at ASI Sign, Jeld Wen, and Priority Plastics in Grinnell, respectively. He loved spending time with his grandchildren. His enjoyments including hanging out with his friends, going for bike rides, and attending concerts. Ron is survived by his parents, Kenneth and Joyce Shook of Grinnell; his daughter, Kali Shook of Marshalltown; his grandchildren, Gabriel Osborn and Ayrton Shook, both of Marshalltown; and a niece, Crystal Ross of Salem, New Hampshire; and a nephew, Kendell Mikkelson of Grinnell. He was preceded in death by his siblings, Larry Shook and Susan Harvey. To send flowers or a remembrance gift to the family of Ronald A. Shook, please visit our Tribute Store. "Email Address" would like to share the life celebration of Ronald A. Shook. Click on the "link" to go to share a favorite memory or leave a condolence message for the family.